Portions of Zaha Hadid's residential building in New York are set to become art galleries, while more exhibition spaces designed by Studio MDA will also be created underneath the adjacent High Line elevated park. Developer Related Companies announced the creation of 15 new galleries on West 28th Street and West 27th Street in West Chelsea, which is home to many art galleries and cultural institutions. The almost complete 520 West 28th – the late British-Iraqi architect's only building in New York City – will accommodate exhibition spaces ranging from 1,000 to 5,400 square feet (93 to 502 square metres). Existing neighbouring structures and new buildings by New York firm Studio MDA will also host a set of standalone exhibition spaces, which will measure between 650 and 1,800 square feet (60 and 167 square metres) and be known as the High Line Nine. 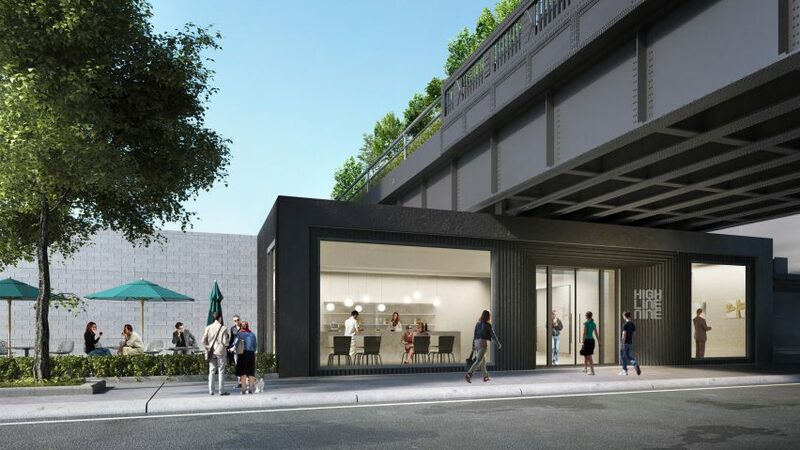 Some of the galleries will face onto a central covered thoroughfare running directly underneath the popular public park, which was created along a disused elevated railway. They will share a catering kitchen and restroom facilities for events, and there will also be a wine bar and cafe on site. "This is an ideal situation for international or domestic gallerists who want a street level location in West Chelsea with built in vibrancy and traffic but don't want the hassle and cost of leasing and maintaining conventional gallery space," said Related. The gallery spaces inside Hadid's building are due to open during spring 2017, while the High Line Nine is scheduled to complete later in the year. The elevated park, designed by Diller Scofidio + Renfro and James Corner Field Operations, has spurred development in the Chelsea neighbourhood since its first phase completed in 2009. It connects the trendy Meatpacking district in the south to the vast Hudson Yards development – also part of Related's portfolio – under construction to the north, where further cultural venues are also underway. New York gallerist Paul Kasmin has confirmed he will take a 5,000-square-foot gallery and an additional exhibition space in the High Line Nine. "The creation of the High Line and the evolution of Hudson Yards have made this one of the most dynamic parts of the city," said Kasmin. "This collection of new galleries in this location is an ideal fit for us." Also proposed along the High Line is a glass tower "sculpted by the angles of the sun" by Studio Gang.